April showers bring may flowers or so the saying goes. It is a common saying among persons in the English speaking world that marks the transition from April to May, from a month of rain to a month of blossoms. That is the thought that came to mind when I took the photo of this tulip right after the heavy rainfall experienced on April 30. I had just arrived at work a day after some of the heaviest rainfall I had ever experienced on Long Island; I would say about three inches. Things were still pretty damp and the sun had not risen yet. I took the time to walk the grounds with camera in hand and noticed a bed of tulips outside the office window. The excessive rains from the previous day had weighed down the tulips causing them to lean over into the leaves at the bottom of their stems. Some had become contorted, and others had lost some of their petals, while others drew a beautiful contrast between their bright colours and the deep green folds of their leaves. The later was the concept I tried to capture in my photograph. I chose to avoid the focus on the colour of the elements in the scene but instead communicate the texture and form of those elements. 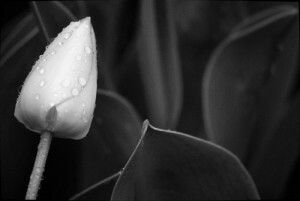 The folds of the leaves provide a somewhat painterly, dark backdrop to the light areas of the tulip’s foreground. The beads of water from the rain not only draw interest but emphasize the tulip bud as it is the only element in the scene which has it. The bud itself draws interest due it is brightly coloured, and almost fragile appearance. Collectively, they form a tapestry of contrasting yet, complimentary textures of that experience. And, It was also apparent in the tulip bed outside my office window.